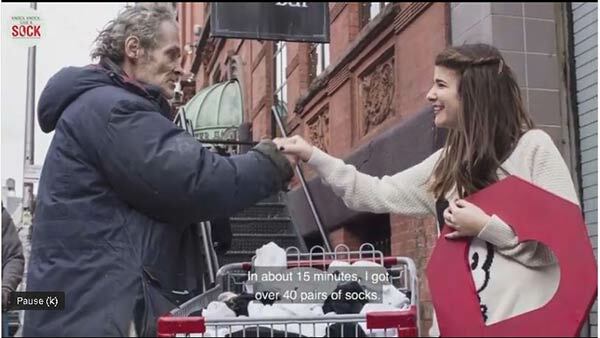 NEW YORK -- Find out about 'Knock, Knock, Give a Sock' and how it is working to humanize homelessness one sock at a time. Knock Knock, Give a Sock is an organization that collects the most needed, but least donated article of clothing for those experiencing homelessness: socks. While many people donate clothing, 9 out of every 10 people who have donated clothing have never donated a pair of socks. On top of that, most organizations do not accept gently used socks, but at KKGS - we do! Our partners and volunteers collect socks through drives and sometimes, by quite literally knocking on the doors of their colleagues, classmates, and neighbors. In addition to collecting socks for those in need, KKGS aims to reduce the stigma associated with homelessness. Through our Meet Your Neighbors Dinners and the Hakook Team, KKGS attempts to bring together those who are and are not experiencing homelessness in order to encourage discussions and ultimately dissipate the stigma.